Before the arrival of the Europeans, various tribes of Native Americans lived in what is now New York State. There were two primary confederations: the Algonquian and the Iroquois. 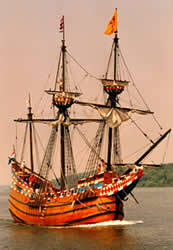 Henry Hudson sailed up what is now called the Hudson River in 1609. He claimed the region for the Dutch. What is now New York City was called New Amsterdam, and the country beyond (now called Upstate) was called the New Netherlands. New York remained a British colony for more than a century, until declaring independence in 1776. The new state joined 12 other colonies to create the first 13 states of the United States of America. 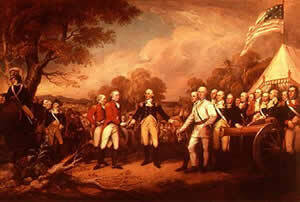 Many decisive Revolutionary War battles were fought in New York, including the Battle of Saratoga, which most scholars consider the turning point in the war. After the Revolutionary War, George Washington predicted that New York would be the "seat of the Empire," giving New York its nickname "the Empire State." Late 17th Century: The Dutch in New Amsterdam construct a crude wall of timber and earth to keep out invading British. While the wall was never tested in battle, it became a site of trade and commerce: Wall Street. Later, at the site of a tree at one end of the street, where traders and dealers would gather informally, the New York Stock Exchange was founded. This was the start of New York’s importance to the nation’s economy, and later to the global economy. Visit here for more information on the history of the New York Stock Exchange and Wall Street. 1609 - After sailing to the New World on the Halve Maen, Henry Hudson explored the mighty river that would later be named for him. Samuel de Champlain explored the northeastern region of the area now called New York and discovered, Lake Champlain. 1775 - The Revolutionary War. On May 10, 1775, Ethan Allen, Benedict Arnold and 83 “Green Mountain Boys” surprised the sleeping British garrison at Fort Ticonderoga and took the fort called the Key to a Continent without firing a shot. This was the first American victory of the Revolutionary War. 1776 - After serving as a colony of Great Britain for over a century, New York declared its independence on July 9, becoming one of the original 13 states of the Federal Union. 1792 - The New York Stock Exchange was founded in New York City. 1797 – Albany is selected as the third capital of the state. Lawmakers had previously been headquartered in New York City and Kingston. More information about Albany is at www.albanyny.org/. 1807 – Robert Fulton demonstrates the steamboat on the Hudson River, opening the door for further trade and increased travel between the southern and northern parts of the state. More on the steamboat and Robert Fulton. 1817 – Construction of the Erie Canal begins. The Canal was completed and opened in 1825. It linked New York City with Buffalo and the Midwest. For more on the importance of the Erie Canal and how it helped to shape the economy and demographics of the state, visit this Web site. 1825 - The Erie Canal opened in 1825, linking the Hudson River to the Great Lakes and leading to greater development in the western part of the state. 1827 - New York outlawed slavery. At the forefront of the Underground Railroad movement, New York had more anti-slavery organizations than any other state and strong abolitionist leaders such as Harriet Tubman, Frederick Douglass and John Brown. From the early 1800s until the end of the Civil War in 1865, thousands of people passed through New York as they traveled to freedom in Canada. 1837 - Martin Van Buren, born in Kinderhook, became the eighth President of the US. 1850 - Millard Fillmore, born in Cayuga County, became the 13th President of the US. 1883 – The Brooklyn Bridge, which connects Brooklyn with Manhattan, opens with great fanfare. For more interesting facts about this architectural marvel and its importance to New York, the city and state, visit this Brooklyn Bridge Web site. 1886 - The Statue of Liberty, a gift from France to the United States in honor of the Centennial of the American Declaration of Independence, was dedicated on October 28 in New York Harbor. 1892 – Ellis Island opens making the state the gateway into America. Only four years later, in 1896, the Statue of Liberty, a gift from France, was dedicated in New York’s harbor. Go here for more on New York’s place in immigration history. 1895 – New York lawmakers pass the “Forever Wild” amendment to the state constitution. The amendment guarantees that the Adirondack and Catskills Forest Preserve will forever be protected from development. New York is the only state to have such an amendment, and today, the Adirondack Park, comprised of 6 million acres, is the largest state park in the continental United States and six times the size of Yellowstone National Park. For more information on New York’s “Forever Wild” amendment, and the Adirondack Forest Preserve. 1899 - The State Capitol at Albany was completed. 1901 - When President William McKinley was assassinated in Buffalo, Theodore Roosevelt (born in New York City), was hurriedly sworn in as the 26th president of the US. Not quite 43 years old, TR became the youngest president in the nation's history. 1912- The New York Yankees begin playing in pinstripes. 1929 – The stock market crashes and the Great Depression begins. Tens of millions of American citizens find themselves destitute, and, for the first time in American history, banks collapsed. New York’s governor at the time, Franklin D. Roosevelt, extends relief and provides a general pension system for individuals over the age of 70. Roosevelt was elected President in 1932 and extended the New York program to the nation in what became the Social Security system. Across New York, localities begin public works projects to put the unemployed to work. Those projects include such things as the Triborough Bridge and as well as the clubhouse at the old Albany Municipal Golf Course. 1931 – On May 1, the 102-story Empire Building is dedicated. It remains the tallest building in the state until the construction of the World Trade Center in 1972. The Empire State Building’s official page, with more information on the building's construction, use and history, is at www.esbnyc.com. 1932 – Lake Placid was home to the 1932 Winter Olympics. 1933 - Franklin D. Roosevelt, born near Hyde Park, became the 32nd President of the US. 1941 – America's involvement in World War II begins with bombing of Pearl Harbor by Japanese forces on December 7, 1941. New York operated as an important manufacturing, recruiting and embarkation base for the nation’s war effort as well as the home of the Manhattan Project that developed the atomic bomb. 1950 – The new international conference of countries, the United Nations, establishes its headquarters in New York. For more information on the UN and its history, visit www.un.org. 1955 – December 15, 1955, the 1,212 foot long Tappan Zee Bridge is opened to traffic. The toll is 50 cents. 1959 – Construction begins on what is now The Governor Nelson A. Rockefeller Empire State Plaza. 1961 - The Vietnam War. The New York State Vietnam Memorial at the Empire State Plaza in Albany commemorates the military service of New York State residents who served their country in Southeast Asia between 1961 and 1975. 1964 – The New York World’s Fair opens in Flushing, Queens. William A. Shea Stadium , the home of the New York Mets opened five days before fair on the same site. 1969 - The three-day Woodstock Music & Art Fair was held on a former dairy farm in Bethel. The open-air festival featured icons of rock music and attracted half a million fans. 1970 – The North Tower of the World Trade Center is completed. In 1973 the South Tower was opened. At 110 stories apiece, each of the Twin Towers had its own zip code. The towers remained the tallest buildings in the world until 1973, when the Sears Tower in Chicago was completed. 1980 – Lake Placid was home to both the 1932 and 1980 Winter Olympics. 1993 - On February 26, a terrorist attack at the World Trade Center killed six people and injured over 1000. Al-Qaeda involvement was suspected. 2000 - Former first lady Hillary Clinton was elected to the US Senate. She was the first female senator to represent New York. 2001 - The Twin Towers are destroyed in the September 11 terrorist attacks. More than 2800 were killed in the attacks on the towers, including hundreds of New York firefighters and police officers. 2006 – Groundbreaking ceremonies are held to mark the start of construction of the new Yankee Stadium. 2013 – On May 10 the final component of the Freedom Tower(One World Trade Center is installed, making the building the tallest in the Western Hemisphere at 1,776 feet.